Technical Car Experts Answers everything you need: How to attach the cable that goes into the caliper on Buick Car? How to attach the cable that goes into the caliper on Buick Car? Remove the hubcap(s) if applicable and loosen the lug nuts with a tire iron before lifting the wheel(s) you intend to install the caliper on. Place the C-clamp over the back of the caliper housing and the drive of the clamp onto the backing plate of the outboard pad. Tighten the clamp to compress the caliper piston. Pull down on the parking brake cable (on the rear calipers only) and then remove the cable from the cable connector on the caliper. Place a drain pan below the wheel where the brake hose attaches to the caliper. Place a brake hose clamp onto the brake hose just a few inches away from where it connects to the caliper. Remove the brake hose bolt from the caliper using a ratchet and socket or a box-end wrench. Be sure to remove the old copper washers from both sides of the brake hose bolt. Remove the two caliper guide bolts with a ratchet and socket or a box-end wrench (front calipers only). Remove just the lower bolt on rear calipers and then pivot the caliper upward to slide it off the upper caliper pin bolt. Open the bleeder screw of the new caliper until a steady trickle of brake fluid begins to purge from it. Be sure to align the drain pan to catch the fluid. Remove the master cylinder cover and check the fluid often so it does not run out of fluid. When a steady trickle is achieved, tighten the bleeder screw, top off the master cylinder with new brake fluid and then replace the cover. 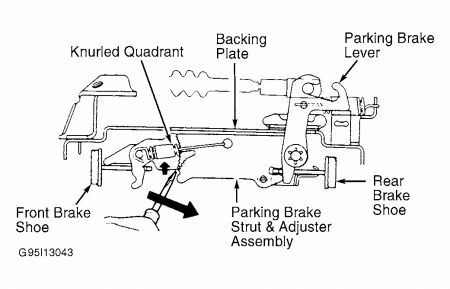 Employ an assistant to carefully get into the Buick and pump the brake pedal four to five times. While the assistant is holding pressure down on the brake pedal, reopen the bleeder screw to purge the air from the brake lines. Repeat this procedure until the brake pedal feels firm and the brake fluid lacks air bubbles. Top off the master cylinder with new brake fluid again and then replace the wheel and lug nuts. Clean off any dirt and corrosion from the brake caliper by hand. Place a little bit of standard lithium grease around the base of the piston. Stick the needle nose pliers down into the end of the piston, and hook it on the two notches on either side of the piston. Twist the pliers clockwise, causing the piston to screw into the housing. Stop twisting when about 1/8 inch of the piston is still sticking out of the caliper housing. Remove 2/3 of brake fluid from master cylinder reservoir. Mark relationship of wheel to axle flange, then remove wheel and tire assembly. Remove bolt and washer attaching cable support bracket to caliper body, Fig. 2. Remove sleeve bolt and pivot caliper assembly up, Fig. 3. Do not completely remove caliper assembly body. Remove outboard and inboard shoe and linings and two pad clips from caliper support. Using a suitable spanner type tool in piston slots to turn piston assembly and thread it into caliper body assembly. After bottoming piston, lift inner edge of boot next to piston assembly and press out any trapped air. Ensure slots in end of piston are positioned as shown in Fig. 4 before pivoting caliper body assembly down over shoe and linings in caliper support. Use suitable spanner type tool to turn piston as necessary. Install pad clips and outboard and inboard shoe and linings in caliper support. Ensure wear sensor is on outboard shoe positioned downward at leading edge of rotor during forward wheel rotation. Pivot caliper body assembly down over shoe and lining assemblies being careful not to damage piston boot on inboard shoe. After caliper body is in position, recheck installation of pad clips. If necessary, use a small screwdriver to reseat or center pad clips on support abutments. Install sleeve bolt and torque to 20 ft. lbs. Install cable support bracket and torque bolt to 32 ft. lbs. Install wheels and tires aligning previous marks, then lower vehicle. Apply approximately 175 lbs. of force to brake pedal three times to seat shoe and linings against rotor. Remove the left side instrument panel insulator. Remove the left carpet retainer. Pull back the carpet for access. Raise and suitably support the vehicle.Relieve cable tension from the park brake system at the equalizer. Disconnect the front cable (1) from the rear cable (3) at the connector clip (2). Disconnect the electrical connector at the parking brake switch. Remove the 3 park brake pedal assembly retaining nuts from the body mounting studs. Remove the retaining clip and disconnect the parking brake cable (1) from the park brake pedal assembly. Use the special tool in order to remove the cable from the pedal assembly. Remove the park brake pedal assembly. Install the park brake pedal assembly. Connect the park brake cable (1) to the park brake pedal assembly and install the retaining clip. Install the 3 park brake pedal assembly retaining nuts. Tighten the nuts to 25 N·m (18 lb ft). Connect the electrical connector to the parking brake switch. Connect the front cable (1) to the rear cable (3) at the connector clip (2). Adjust the park brake system. Lower the vehicle. Position the carpet in place. Install the left carpet retainer. Install the left side instrument panel insulator. The cable is under the left side (drivers side ) near the center to rear of the vehicle .You will need to get under vehicle to loosen cable. Relieve the park brake system tension at the equalizer assembly. Remove the rear caliper bracket. Remove the rear rotor. Disconnect and remove the rear park brake cable from the bracket at the rear wheel. Disconnect the park brake cable return spring from the park brake actuator and bracket at the rear wheel. The rear hub, backing plate, park brake cable bracket, and park brake actuator will be removed as an assembly. Remove the 2 retainers (9) and the park brake cable bracket (8) from the park brake actuator (4). Position the rear hub aside . Remove the park brake shoe and actuator (4) from the backing plate (7). Separate the actuator (4) from the park brake shoe . Assemble the actuator (4) to the park brake shoe. Install the park brake shoe and actuator (4) onto the backing plate (7). Tighten the bracket retainers to 14 N·m (124 lb in). The rear hub, backing plate, park brake cable bracket, and park brake actuator will be installed as an assembly. Install and connect the rear park brake cable to the bracket at the rear wheel. Connect the park brake cable return spring to the park brake actuator and bracket at the rear wheel. Install the rear rotor. Install the rear caliper bracket. Install the rear tire and wheel assemblies. Adjust the park brake system. Lower the vehicle. Raise and support vehicle. Remove wheel assembly, and remove drum retainers. To release brake strut and quadrant, remove plug in backing plate and insert screwdriver between brake strut and knurled quadrant. Push screwdriver forward to separate brake strut and knurled quadrant. Remove brake drum. Remove brake shoe hold-down springs, pins, and brake shoe return springs. See Fig. 2 . Remove brake shoes and parking brake return spring. Disconnect brake strut and quadrant from brake shoe. Remove parking brake cable from cable anchor on trailing brake shoe. Position leading brake shoe, and install hold-down spring pin and hold-down spring. Install brake shoe return springs. Adjust brake shoes. 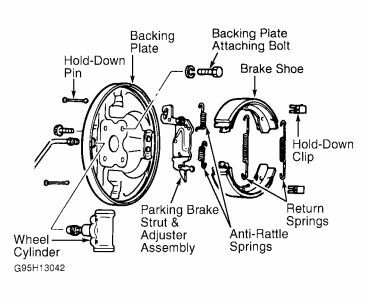 See REAR BRAKE SHOES under ADJUSTMENTS. To complete installation, reverse removal procedure. Bleed brakes (if necessary). Labels: How to attach the cable that goes into the caliper on Buick Car.